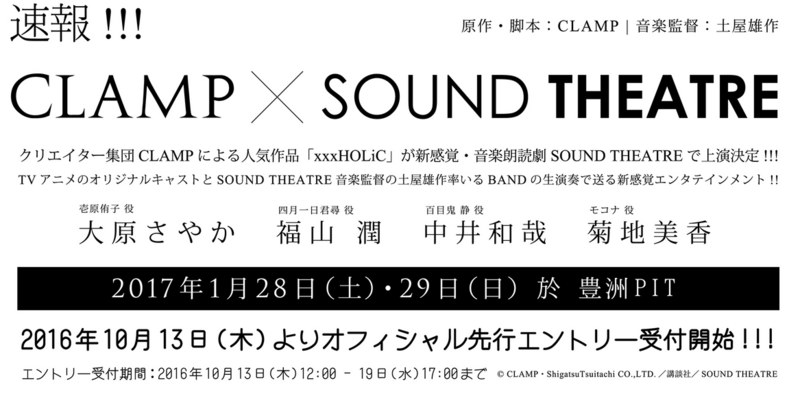 In a collaboration between CLAMP and SOUND THEATRE, XXXHOLiC will be getting a stage reading drama with CLAMP’s script, the XXXHOLiC anime original cast, SOUND THEATRE music director and a live band. For those not able to attend, we can only hope that we’ll get some sort of DVD/Blu-Ray release for this. Whoa, this looks so cool! Is it something like they did for Clamp Festival? With the voice actors reading the script and acting a little bit on stage, but this time with a live band playing the “soundtrack”? Despite the postponements I’m glad to see that Holic is not “forgotten” but actually having new related events! I’m loving the idea of it being a stage play!! Just imagine those gorgeous yuuko costumes. Unless its just a sit and read with a bit of acting… But still!!! Either way, the characters and story are perfect for a stage play. Especially watanuki, yuuko, and the silent moody contrast of doumeki. Oh I wana see it!!! Anyway, I love all things holic. That live action was just beautifully made. On another note, wasn’t there fashion based on yuuko, was it underwear? Or was it shoes? I think they shall be in costumes, at least I think we can expect that. Yes, it was a collaboration and it there were lingerie, shoes and hair accessories, I think? All those adaptations…and not a single critical award for thirteen years, huh? Yeah its true its lost its flow, and i admit i dont find myself as excited for the rei arc, but No I don’t think so. I dont think its decaying yet. It still has potential. We’re yet to see Watanukis full flare as the shop owner. Clamp seem to be preparing things for a new and more plot driven arc. and I think holic has been done in a way where it can be blended in with other clamp manga cause of the shop. It’s very cleverly done.